I don’t think I’ve ever had a great video chat experience on my smartphone or tablet. Until now, I assumed that was just because I’m super-awkward, but the team behind a startup called Net Power & Light seems to think there’s a broader problem here, one that it’s trying to solve with the launch of a new app called Spin. Obviously, there are plenty of other chat services out there, including Apple’s own FaceTime. But when Net Power & Light co-founder and CEO Tara Lemmey gave me a demo, I had to admit that it felt pretty different. There’s no single feature that makes Spin stand out, but as a whole it has clearly been optimized around the touch experience of an iPad (and to a lesser extent the iPhone and iPod Touch). When you’re chatting with someone, it’s easy to use the screen to zoom in and out of the video, and also to share and swipe through photos and videos (which can be imported from Facebook, Flickr, or their iOS camera roll). Other features include the ability to invite people for a scheduled call (you can have up to 10 people on a call), adjust the audio mix of the call (you just increase the size of someone’s image to make them louder and decrease it to make them softer), and introduce fun, random elements to the call by doodling or adding “FXPs” like paper airplanes or hearts. The video and audio are also pretty high-quality. To illustrate that, Lemmey brought multiple people from multiple locations onto the demo chat, some of them in the Net Power & Light office, others out-and-about in San Francisco, without Wi-Fi, and everything ran smoothly. 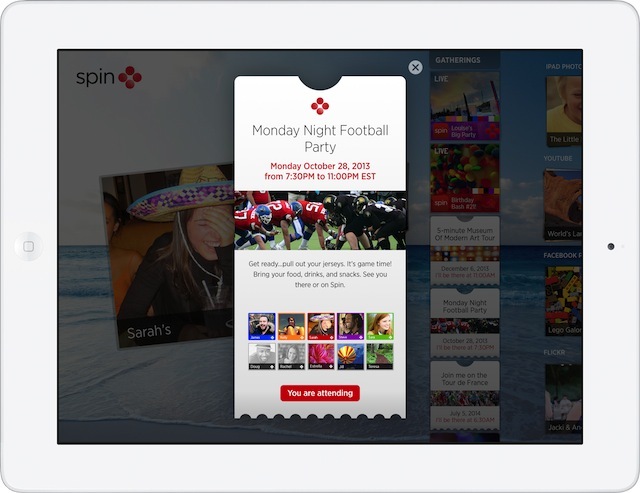 Although Spin feels like a consumer product, the company says it has been tested out by organizations such as Harvard University, TED, and DC United — this could be used for business video conferencing, or for larger webinars and virtual classrooms. In fact, it sounds like Net Power & Light sees a bigger business opportunity by selling the technology to enterprises. It’s a good thing the app looks as nice as it does, by the way, since the company has apparently been developing the technology since 2009. Net Power & Light has raised an undisclosed amount of funding from investors that include Alsop Louie, John Seely Brown, BSkyB, and Singtel Innov8.